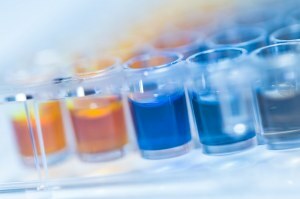 The simplest, yet sensitive series of assays in the market !!!! No Perchlorique acid - Faster protocole compared to classic method, eliminates special handling and waste-disposal protocols. Hydroxyproline (Hyp) is a nonproteinogenic amino acid, found in collagen, containing approximately 12-14% Hyp by mass. Hydroxyproline in tissue hydrolysates is thus, a direct measure of the amount of collagen present. Collagen is the most abundant protein in mammals and many diseases are believed to affect collagen turnover, including tumor invasion and metastasis, rheumatoid arthritis, cardiopulmonary fibrosis and muscular dystrophy. The classical assay for determination of Hyp and Collagen is based upon Hyp oxidation, followed by reaction with Ehrlich's reagent dissolved in concentrated perchloric acid (PCA). However, PCA requires special handling and waste-disposal protocols. Hydroxyproline Assay Kits (K555: Classic Method and K226: Perchlorate-Free Method) and Total Collagen Assay Kits (K218: Classic Method and K406: Perchlorate-Free Method) use proprietary developer solutions to accurately measure Hyp and Total Collagen in tissue and protein/peptidase hydrolysates. They are quick, can detect a minimum of 0.05 µg hydroxyproline/0.5 µg collagen per well in a 96-well format and generate colorimetric results that are virtually identical. Figure (A). Correlation between hydroxyproline standard curve absorbance values obtained using the classical perchloric acid-based assay kit (K555-100) and the perchlorate-free assay (K226-100. The two assay methods show excellent correlation (R2 > 0.999). (B). Estimation of total hydroxyproline content in rat tissues using K226-100. Data are mean ± SEM of 3-4 replicates, assayed according to the kit protocols.